ALBLASSERDAM, Netherlands, Jan. 27, 2019 /PRNewswire/ -- Oceanco's 106.7m Black Pearl won top honors at the 2019 Boat International Design & Innovation Awards that took place on the 27th of January in Cortina. This unique and complex vessel took home the award for "Best Naval Architecture for Sailing Yachts." A true sailing yacht, Black Pearl is capable of crossing the Atlantic without using any fuel. 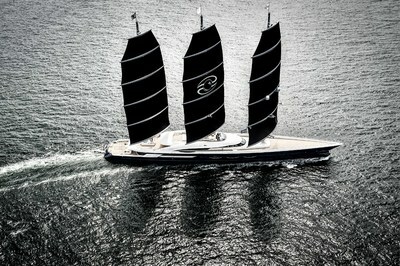 Under sail power the yacht can regenerate enough energy to power full house load, obviating the need to run generators. Black Pearl 's hybrid propulsion system also has the ability to regenerate energy, as well as on board systems, such as the waste heat recovery system allowing further gains in overall energy efficiency. "Our relationship and cooperation with the owner and his representatives proved invaluable," says Oceanco Project Manager, Hans Boerakker, "After all, Black Pearl completely reflects the Owner's dream and his vision. We were fortunate enough to be the builders of his dream."